This is the message area! You can do any quick messages that you want here. This is a second message..
Every time you post a message it will post up on top of the site. I generated this message first so that it will be read second. But you can post edit and delete these message as you wish. You can change the page to what ever theme you would like to preview. 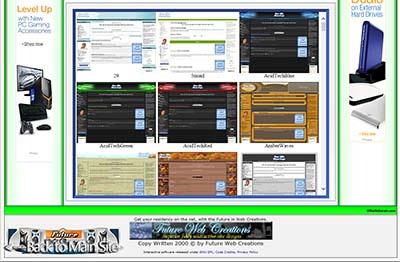 However you will have to change the theme back again once you navigate around the site. So choose Forums and then click the drop down to find the them you would like to preview. There are thumbnails below to see which ones you would like to see this page changed too. 1st Topic : This is a news post. This is where you can post news about your site. This news will be down the center of the page. Every time you post a new news article, it will show up above the last one on the center of the page. 2nd Topic : This is a 2nd news post. You can create any topic you want. And you can have as many as you want. For example, you can have a topic called daily sales. And then you can have weekly sales, monthly sales, daily news, weekly news, monthly news are anything you can think of that will relate to your site. Click on any image to change this whole site to that theme. Finally, blocks that cannot be edited through the administration menu or through a file are known as System blocks. By default, only two System blocks exist: "Administration" and "User's Custom Box"